CentOS Community-supported Linux distribution designed as an OpenSource version of RHEL and well suited for servers. Fedora Community-supported Linux distribution sponsored by Red Hat. openSUSE A community-developed Linux distribution, sponsored by SUSE. It maintains a strict policy of ensuring all code in the standard installs will be from FOSS solutions, including Linux kernel Modules. SUSE's enterprise Linux products are all based on the codebase that comes out of the openSUSE project. Mandrake Linux The first release was based on Red Hat Linux (version 5.1) and KDE 1 in July 1998. It had since moved away from Red Hat's distribution and became a completely separate distribution. The name was changed to Mandriva, which included a number of original tools, mostly to ease system configuration. Mandriva Linux was the brainchild of Gaël Duval, who wanted to focus on ease of use for new users. Asianux A Linux distribution co-developed between Red Flag Software Co., Ltd., Miracle Linux Corp. and Haansoft, INC., focused on Chinese, Japanese and Korean support. Red Flag Linux A Linux distribution developed in China and optimized for the Chinese market. Based on Asianux. Rocks Cluster Distribution A Linux distribution for building a High-Performance Computing computer cluster, with a recent release supporting Cloud computing. It is based on Red Hat Enterprise Linux but with extensions to support large multi-node heterogeneous systems for clusters (HPC), Cloud, and Data Warehousing (in development). Scientific Linux A Linux distribution co-developed by Fermi National Accelerator Laboratory and the European Organization for Nuclear Research (CERN), which aims to be compatible with and based on Red Hat Enterprise Linux. Fedora is a community supported distribution. It aims to provide the latest software while maintaining a completely Free Software system. BLAG Linux and GNU A completely free software distribution. EnGarde Secure Linux Server-only Linux distribution designed to be secure. Korora Initially aimed at easy installation of a Gentoo system by using install scripts instead of manual configuration. Now based on Fedora. MeeGo Built by Intel and Nokia, intended for mobile phones (mainly Nokia N9) and tablets. It is based on Moblin together with Maemo. MythDora Specialized Linux distribution for easy setup of the MythTV PVR software, similar to KnoppMyth, based on Fedora. Qubes OS Focused on security for desktop users. Based on an "ancient" Fedora release which we are somewhere said it to upgrade under YUM. Sugar-on-a-Stick Linux An educational operating system for the children of the OpenMandriva world, originally designed for the One-Laptop-Per-Child project. Trustix A Linux distribution focused on security. SUSE Linux Enterprise Desktop Previously branded Novell Linux Desktop. A desktop-oriented Linux distribution supplied by SUSE and targeted at the enterprise market. SUSE Linux Enterprise Server A server-oriented Linux distribution supplied by SUSE and targeted at the business market. SUSE Studio SuSE studio is the html5 frontend over KIWI. GeckoLinux Have offline Live-USB/DVD installer, editions with a different desktop environment, have pre-installed programs like a proprietary drivers. Have Static and Rolling editions. 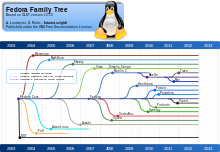 Mandriva Linux Open-source distribution (with exceptions), discontinued in 2011. Mageia A community Linux distribution initially forked from Mandriva Linux in response to the discontinuation of free versions of Mandriva Linux. ROSA Linux A Russian distribution available in three different editions: ROSA Desktop Fresh, ROSA Enterprise Desktop and ROSA Enterprise Linux Server, with the latter two aiming at commercial users. Its desktop editions come bundled with proprietary software such as Adobe Flash Player, multimedia codecs and Steam. OpenMandriva The last release of Mandriva Linux was in August 2011. Most developers who were laid off went to Mageia. Later on, the remaining developers teamed up with community members and formed OpenMandriva, a continuation of Mandriva. PCLinuxOS A rolling release Linux Live CD distribution. Originally based on Mandrake 9.2. Later rebased on Mandriva 2007. Vine Linux A Japanese distribution originally based on Red Hat Linux. ALT Linux ALT Linux is a set of RPM-based operating systems built on top of the Linux kernel and Sisyphus packages repository. ALT Linux has been developed collectively by ALT Linux Team developers community and ALT Linux Ltd. This list is about the distributions using the .rpm packages, excluding derivatives over zypp or Fedora or urpmi or apt-rpm. cAos Linux A general purpose Linux distribution. Designed to have low overhead, run on older hardware, and be easily customizable. Turbolinux Originally based on Red Hat Linux. YOPER A rolling release desktop distribution from New Zealand that focuses on optimizing system performance for workstation use. Discontinued. Debian is a distribution that emphasizes free software. It supports many hardware platforms. Debian and distributions based on it use the .deb package format and the dpkg package manager and its frontends (such as apt-get or synaptic). BackTrack Developed by Offensive Security and designed for penetration testing. In March 2013, the Offensive Security team rebuilt BackTrack around the Debian distribution and released it under the name Kali Linux. Ubuntu A free and open-source operating system and Linux distribution based on Debian. Ubuntu is a distribution based on Debian, designed to have regular releases, a consistent user experience and commercial support on both desktops and servers. Ubuntu Server An official derivative made for use in servers. Ubuntu Server handles mail, controls printers, acts as a fileserver, can host LAMP and more. Gobuntu Gobuntu was an official derivative of the Ubuntu operating system, aiming to provide a distribution consisting entirely of free software. It was officially announced by Mark Shuttleworth on July 10, 2007, and daily builds of Gobuntu 7.10 began to be publicly released. The project ended around the release of 8.04 and has since merged into mainline Ubuntu as a 'free software' option. Mythbuntu Based on Ubuntu and MythTV, providing applications for recording TV and acting as a media center. On 4 November 2016 the development team announced the end of Mythbuntu as a separate distribution, citing insufficient developers. Ubuntu JeOS "Just Enough OS" – was described as "an efficient variant [...] configured specifically for virtual appliances". Since the release of Ubuntu 8.10 it has been included as an option as part of the standard Ubuntu Server Edition. Unofficial variants and derivatives are not controlled or guided by Canonical Ltd. and generally have different goals in mind. BackSlash Linux BackSlash Linux is an Ubuntu and Debian-based operating system for AMD64 and Intel x64 based Personal Computers developed in India. It is based on free software and every release of the operating System is named after the characters of the Disney blockbuster, Frozen. Bodhi Linux An Ubuntu-based Linux distribution featuring the Moksha Desktop environment and targeting users who want a minimum of preinstalled software or low system requirements. Cub Linux Ubuntu-based distribution designed to mimic the desktop appearance and functionality of Chrome OS. elementary OS A distribution focussing mainly on non-technical users, has a pay-what-you-want model. Emmabuntüs Based on Xubuntu designed to facilitate the repacking of computers donated to Emmaüs Communities. GendBuntu A version adapted for use by France's National Gendarmerie. Iskolinux A Linux distribution packaged and maintained by UP Manila's (UPM) Information Management System as part of University of the Philippines' thrust to migrate to Linux. Joli OS Joli OS (formerly named Jolicloud) is in development and Pre-beta testing. Joli OS is built upon Debian and Ubuntu 9.10, but is tweaked to be more suitable for computers that have weaker specifications in terms of disk storage, memory and screen size. It is designed to run on relatively low-powered netbook computers. Linux Lite The purpose of Linux Lite is to introduce Windows users to Linux, and provide them with a comfortable and useful user experience. It is designed to be simple and suitable for new Linux users who want a lightweight, highly responsive, and fully functional environment. Linux Mint Linux Mint synchronizes its release-cycle with Ubuntu's long term support, and is tailored to user-friendliness for desktop users. LinuxMCE Linux Media Center Edition, a Kubuntu-based distribution that provides in-depth HTPC functionality as well as home automation. Netrunner Kubuntu based distribution with complete software and codecs installed, developed by Blue Systems (also sponsoring Kubuntu and LinuxMintKDE). Poseidon Linux For academic and scientific use. Based on Ubuntu, but enhanced by GIS/maps, numerical modelling, 2D/3D/4D visualization, statistics, tools for creating simple and complex graphics, programming languages. Qimo 4 Kids Educational games for children aged three and up. Ubuntu-based with easy-to-use interface. Ututo Ututo UL ("Ubuntu-Libre") Distributes Simusol, a system to simulate Solar Energy projects, returned to the heart of the project. Zorin OS Zorin OS is a user-friendly distribution that can emulate Microsoft Windows or Mac OSX. It is meant for users unfamiliar with Linux. MEPIS Focuses on ease of use. Also includes a lightweight variant called antiX. antiX is meant to be used on older computers with limited hardware. There is also a Xfce distro called MX Linux that's based on Debian Stable. Raspbian Desktop-oriented distribution. Developed by the Raspberry Pi Foundation as the official OS for their family of low-power single-board computers. SteamOS Debian-based and gaming-focused distribution developed by Valve Corporation and designed around the Steam digital distribution platform. Astra Linux OS developed for Russian Army with raised security. Canaima A Venezuelan Linux distribution. Corel Linux Commercial. Short-lived desktop Linux distribution, bought by Xandros Linux. CrunchBang Linux A small Linux Distro and Live CD based on Debian Stable, featuring the Openbox window manager and tint2 panel with GTK+ applications. Development has ended for CrunchBang as of February, 2015. Devuan A fork of Debian begun in 2014 with the primary goal of allowing user choice in init systems, by decoupling software packages from systemd. Elive A Belgian Linux distribution that is lightweight but still provides an attractive Graphical User Interface. Ideal for older devices. Emdebian Grip A small-footprint Linux distribution based on and compatible with Debian, intended for use on resource-limited embedded systems. gNewSense Originally based on Ubuntu and later upon Debian, and developed with sponsorship from the Free Software Foundation. Its goal is user-friendliness, but with all proprietary (e.g. binary blobs) and non-free software removed. Kanotix An installable live DVD/CD for desktop usage using KDE and LXDE, focusing on convenient scripts and GUI for ease of use. Maemo A development platform for hand held devices such as the Nokia N800, N810, and Nokia N900 Internet Tablets and other Linux kernel–based devices. MintPPC For PowerPC computers. Although MintPPC uses some Mint LXDE code, it is not Linux Mint. Musix GNU+Linux Intended for music production, graphic design, audio, video editing, and other tasks. It is built with only free software. NepaLinux A Debian- and Morphix-based distribution focused for desktop usage in Nepali language computing. Pardus Developed by Turkish National Research Institute of Electronics and Cryptology. Prior to 2013 it used PISI as the package manager, with COMAR as the configuration framework. Starting with Pardus 2013, it is Debian-based. PelicanHPC Dedicated to setting up a computer cluster. Skolelinux A Linux distribution from Norway, now the basepoint for and now synonymous to Debian EDU. It provides as a thin client distribution for schools. SolydXK Xfce and KDE desktop focused on stability, security and ease of use. SparkyLinux SparkyLinux is a Debian-based Linux distribution which provides ready to use, out of the box operating system with a set of slightly customized lightweight desktops. Sparky is targeted to all the computer’s users who want replace existing, proprietary driven OS to an open-sourced.. The Amnesic Incognito Live System (TAILS) The Amnesic Incognito Live System' or Tails is aimed at preserving privacy and anonymity, with all outgoing connections forced to go through Tor. TurnKey GNU/Linux Open source project developing a family of free, Debian-based appliances optimized for ease of use in server-type usage scenarios. Based on Debian since 2012; previously based on Ubuntu. Univention Corporate Server Enterprise distribution with integrated IT infrastructure and identity management system by the company Univention GmbH, Germany. A full version for up to 5 users for tests and for private use can be downloaded for free. 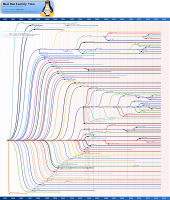 Webconverger Debian Live based browser only distribution, similar to Google Chrome OS. However based on Firefox and dwm, with no user sign-in, no special hardware required and designed for public places. VyOS Free routing platform. Because VyOS is run on standard amd64, i586 and ARM systems, it is able to be used as a router and firewall platform for cloud deployments. antiX It is comparatively lightweight and suitable for older computers, while also providing kernel and applications, as well as updates and additions via the Aptitude and Debian-compatible repositories. MX Linux A midweight OS based on Debian Stable with core components from antiX and using Xfce, offering simple configuration, high stability, solid performance and medium-sized footprint. Knoppix, itself, is based on Debian. It is a live distribution, with automated hardware configuration and a wide choice of software, which is decompressed as it loads from the drive. Damn Small Linux A small Linux distro designed to run on older hardware. It is commonly used on virtual machines due to low memory requirements. Feather Linux Boots from either a CD or a USB flash drive. Uses Knoppix-based hardware detection and the Fluxbox window manager. Hikarunix A Linux distribution solely for studying and playing the game of Go. Based on Damn Small Linux. pacman is a package manager that is capable of resolving dependencies and automatically downloading and installing all necessary packages. Arch Linux An x86-64-optimized distribution targeted at experienced users. Arch runs on a rolling release system and uses the pacman utility for package management. Antergos Derived from Arch Linux with GUI installer and offers multiple choices of desktop environments. Uses GNOME during Setup. ArchBang Based on Arch Linux, but also provides Live CDs with working system and graphical installation scripts; uses Openbox as default window manager. Chakra Linux Originally derived from Arch Linux, with the latest KDE. For now uses the pacman utility for package management. Strives to be Qt-only. Frugalware Linux A general purpose Linux distribution designed for intermediate users. Has some influences from Slackware, and uses a heavily modified version of pacman, Pacman-G2, a fork of a cvs version of the complete rewrite of Pacman-G1 by Aurelien Foret (the old monolithic Pacman-G1 is written by Judd Vinet). The packages are tar archives compressed using xz. LinHES LinHES (Linux Home Entertainment Server) designed for use on Home Theater PCs (HTPCs), providing applications for recording TV and acting as a sound and video center. Manjaro Linux Based on Arch Linux, using its own repositories and ships with Xfce (as the default desktop environment), KDE, Openbox, a net edition without GUI, and also an Xfce netbook edition. Parabola GNU/Linux-libre An Arch derivative without any blobs, plus various added packages. Packages are also built for ARMv7 in addition to i686 and x64. MATE and text-mode distributions available. Hyperbola GNU/Linux-libre An Arch and Debian derivative without any blobs, without systemd support and with OpenRC as its default init system. Packages are built for i686 and x64. Unlike Arch, Hyperbola uses the long-term support model like Debian. Chrome OS Chrome OS is used on various Chromebooks, Chromeboxes and tablet computers. It is primarily Internet-based, launching each app within the Chrome browser. The OS features a user interface that is very similar-looking to Chrome instead of GNOME, Cinnamon, LXQt, Xfce, etc. Knopperdisk A Linux distribution aimed at USB sticks. Sabayon Linux Made in Italy. It is a European Linux distribution based on Gentoo. However, it follows the "out of the box" philosophy, aiming to give the user a wide number of applications ready to use and a self-configured operating system. Like Gentoo, Sabayon uses the rolling release model; it uses a customized version of Red Hat's Anaconda Installer and includes a Media Center application. Tin Hat Linux Based on hardened Gentoo, this distribution is based primarily on security. Slackware is known as a highly customizable distribution that stresses ease of maintenance and reliability over cutting-edge software and automated tools. It is generally considered a distribution for advanced users. Freenix A free and libre derivative of Slackware for x86_64 systems. Frugalware Linux A general-purpose Linux distribution designed for intermediate users who are familiar with command-line operations. Early versions were based on Slackware, but it is now an independently developed distribution. Salix OS Originally a fork of Zenwalk, Salix is a complete Linux distribution fully backwards compatible with Slackware. Uses Xfce, KDE, LXDE, Fluxbox or Ratpoison as its default desktop environment. 32 and 64bits version. Live versions are also available. simpleLinux simpleLinux uses LZMA compression to compress its system files. The project started on year 2007 by a group of Malaysian developer. simpleLinux is a Slackware-based distribution that comes in both Live CD or Persistence version that can be installed to a medium. simpleLinux comes to be a multi-tasking operating system that runs the X Window System. Topologilinux Designed to run from within Microsoft Windows, Topologilinux can be installed without any changes to the user's hard disk. Outdated. VectorLinux A lightweight Linux distribution designed to be easy to use even for new users. Generally considered well-suited for older hardware. Wolvix A desktop-oriented Linux distribution based on Slackware, mainly targeted at home users, featuring Xfce. No longer available. DAVIX A Linux Live CD for data analysis and visualisation. DNALinux A small Linux distribution designed for running bioinformatics software, including BLAST and EMBOSS. Linux From Scratch A distribution and book on how to build GNU/Linux from its source code along with bootstrapping the GNU-tool-chain's sources. Lunar Linux A distribution in which all packages are built from source. It is, in a sense, a Linux from Scratch framework. GuixSD A distribution built around the GNU Guix package manager, which provides purely functional package management with build automation, build isolation, easy system upgrades and rollbacks, and an emphasis on free software. The following distributions can not be categorized under the preceding sections. Alpine Linux A security-oriented, lightweight Linux distribution based on musl and BusyBox. Has a derivative, postmarketOS, for mobile devices. Android Android is a mobile operating system developed by Google, based on the Linux kernel and designed primarily for touchscreen mobile devices such as smartphones and tablets. Dragora GNU/Linux-Libre A Linux distribution written entirely from scratch and sharing some similarities with Slackware. Approved by the GNU Project as a free operating system. ELinOS Linux distribution for embedded systems by SYSGO. ELinOS focuses on industrial application and provides real-time extensions. Familiar Linux Linux distribution for iPAQ handhelds. Foresight Linux A rolling release Linux distribution built around the Conary package manager. GeeXboX Live CD media center Linux distribution, mainly to play special-encoded video files (e.g. : .ogg, XVID) on home theater. Guix System Distribution (GuixSD) Declarative Linux distribution with atomic upgrades and rollbacks built on top of the GNU Guix package manager. Supports amongst others unprivileged package management and per-user profiles. GoboLinux An alternative Linux distribution which redefines the file system hierarchy by installing everything belonging to one application in one folder under /Programs, and using symlinks from /System and its subfolders to point to the proper files. Jlime Linux distribution for the HP Jornada 6xx and 7xx and NEC MobilePro 900(c) handhelds. Linux Router Project Embedded networking appliance progenitor (defunct). Lunar Linux A source code-based Linux distribution descended from Sorcerer. MkLinux A legacy Linux distribution for PowerPC systems that runs the Linux kernel as a server on top of the Mach microkernel. Nitix Developed by Net Integration Technologies Inc., Nitix claims to be the first autonomic Linux kernel–based server operating system. paldo Independently developed desktop operating system and package manager (upkg) with a rolling release format and standard Gnome environment. Prevas Industrial Linux Embedded systems customizable Linux distribution by Prevas. PS2 Linux Sony Computer Entertainment Linux distribution released officially for the PlayStation 2 video game console. Puppy Linux A mini Linux distribution which runs well under low-end PCs – even under 32 MB RAM. rPath A distribution built around the Conary package manager. Discontinued. SliTaz With less than 40 MB a very small Live-Distribution, which uses 256 MB RAM (or with a special edition only 24 MB) for a complete GUI. Softlanding Linux System One of the earliest Linux distributions, developed from 1992–1994; Slackware was originally based on it. Sorcerer A source code-based Linux distribution. Source Mage A source code-based Linux distribution, descended from Sorcerer. Stable Hybrid Release For smartphones, offering Enlightenment's Illume user interface. It is based on FSO. Thinstation Thin client Linux distribution supporting all major connectivity protocols. Void Linux Void is a general purpose operating system, based on the monolithic Linux kernel. Its package system allows you to quickly install, update and remove software; software is provided in binary packages or can be built directly from sources with the help of the XBPS source packages collection. ^ "DistroWatch.com: Fermi Linux". distrowatch.com. ^ "Current 12-18 Month Community Objectives :: Fedora Docs Site". docs.fedoraproject.org. ^ "DistroWatch.com: EnGarde Secure Linux". distrowatch.com. ^ "DistroWatch.com: Trustix Secure Linux". distrowatch.com. ^ "Ubuntu Manpage: deb - Debian binary package format". Manpages.ubuntu.com. Archived from the original on 2013-06-07. Retrieved 2013-07-05. ^ "Ubuntu Manpage: dpkg - package manager for Debian". ManPages.Ubuntu.com. Archived from the original on 2013-06-07. Retrieved 2013-07-05. ^ "BackTrack Linux - Penetration Testing Distribution". www.backtrack-linux.org. ^ "Kali Linux Has Been Released!". 2013-03-12. Retrieved 2013-03-18. ^ "Our Most Advanced Penetration Testing Distribution, Ever". www.kali.org. ^ "About Ubuntu Derivatives". Ubuntu. Retrieved August 19, 2012. ^ "Kubuntu - Friendly Computing". ^ Smart, Chris (May 2009). "Another day, another Ubuntu derivative". Retrieved 2009-05-21. ^ LXDE (February 2009). "Lubuntu? LXDE Meet up with Mark Shuttleworth in Berlin". Retrieved 2009-05-21. ^ Tim. "Ubuntu GNOME approved as official flavour - Ubuntu GNOME". ^ "Ubuntu GNOME - An official flavor of Ubuntu, featuring the GNOME desktop environment". ^ "Ubuntu Server - for scale out workloads - Ubuntu". www.ubuntu.com. ^ "Gobuntu - Ubuntu Wiki". wiki.ubuntu.com. ^ "JeOS - Community Help Wiki". help.ubuntu.com. ^ "BackSlash Linux - Free Operating System". www.backslashlinux.com. ^ "Welcome". 10 August 2014. ^ "Which Linux Chrome OS Clone is Right For You?". Linux.com - The source for Linux information. 17 July 2015. ^ "Chromixium Adds Polish to Chrome - Reviews - LinuxInsider". www.linuxinsider.com. ^ "Cub Linux Is a Worthy Chromixium Offspring - Reviews - LinuxInsider". www.linuxinsider.com. ^ "Chromixium: Ubuntu Linux... if it looked like Chrome OS". Liliputing. 29 April 2015. ^ Inc, elementary. "The fast, open, and privacy-respecting replacement for Windows and macOS ⋅ elementary OS". elementary.io. ^ "Emmabuntus:Community portal/en - Emmabuntus". emmabuntus.sourceforge.io. ^ "Guadalinex Edu Next - CGA". ^ "Linux Schools - Linux Schools". www.linuxschools.com. ^ "Linux Lite Easy to Use Free Linux Operating System". www.linuxliteos.com. ^ Drifter, Carlos Porto of Design. "Main Page - Linux Mint". linuxmint.com. ^ "Home: LinuxMCE home automation". www.linuxmce.com. ^ "Mestre a casa - - LliureX - LliureX". mestreacasa.gva.es. ^ "OpenGEU in Launchpad". launchpad.net. ^ "Pinguy OS - Because using a computer is meant to be easy!". www.pinguyos.com. ^ "Qimo 4 Kids - Software For Kids". Qimo 4 Kids. ^ "Trisquel GNU/Linux - Run free!". trisquel.info. ^ "UberStudent - Linux for Learners". www.uberstudent.org. ^ Saravia, Diego. "Ututo–Home". ututo.org. Retrieved 1 February 2017. ^ "Zorin OS - About". Zorin OS. Zorin Group. Retrieved 21 December 2018. ^ "grml.org - Debian Live system / CD for sysadmins and texttool-users". grml.org. ^ "Knoppix Linux Boot CD, Download Disk and Documents, Discuss, Get Help". knoppix.net. ^ Arthur (22 December 2018). "6 Best Linux Distros of 2018 - Your Ultimate Choosing Guide". ^ "RxArt — Home". RxArt. ^ "FrontPage - Raspbian". www.raspbian.org. ^ "The story of a failure (Corel) - OpenLife.cc". openlife.cc. ^ "The end. / News & Announcements / CrunchBang Linux Forums". CrunchBang Linux Forums. ^ Stahie, Silviu (28 November 2014). "Fork Debian Project Announces the Systemd-less OS Devuan". Softpedia. Retrieved 30 November 2014. ^ "Elive, Fast and Beautiful Linux Distro". Elive Linux. Retrieved 2017-04-21. ^ "Emdebian Grip packages: A smaller Debian-compatible distro". emdebian.org. Retrieved 2014-01-20. ^ "kanotix.com :: GNU Linux Live system based on Debian, optimized for HD-install and high performance". www.kanotix.com. ^ "LEAF — Linux Embedded Appliance Firewall". leaf.sourceforge.net. ^ "maemo.org - maemo.org: Home of the Maemo community". maemo.org. 1 December 2006. ^ "nepalinux.org - Diese Website steht zum Verkauf! - Informationen zum Thema nepalinux". www.nepalinux.org. ^ "Apache2 Debian Default Page: It works". www.openzaurus.org. ^ "DebianEdu - Debian Wiki". wiki.debian.org. ^ "SolydXK Community — English". solydxk.com. ^ "Tails - Privacy for anyone anywhere". tails.boum.org. ^ "TurnKey GNU/Linux: 100+ free ready-to-use system images for virtual machines, the cloud, and bare metal". www.turnkeylinux.org. ^ "UCS Univention Corporate Server: easy-to-use IT operations". ^ "OPENSOURCE Web Kiosk software by Webconverger". webconverger.com. ^ "MX Linux - MX Community". mxlinux.org. ^ "Knoppix Documentation Wiki". knoppix.net. ^ "About Frugalware". Frugalware Stable Documentation. Frugalware Project. Retrieved 2011-09-11. ^ "About Gentoo – Gentoo Linux". www.gentoo.org. ^ "Gentoo X86 Handbook - Gentoo Wiki". wiki.gentoo.org. ^ "Chromium OS Developer Guide". Retrieved January 29, 2015. ^ Vaughan-Nichols, Steven J. "Debunking four myths about Android, Google, and open-source | ZDNet". ZDNet. Retrieved 2017-11-24. ^ "Software Protection Initiative - Main". Spi.dod.mil. Retrieved 2013-07-05. ^ "SliTaz LiveCD Flavors". Association SliTaz. Retrieved 24 March 2015. 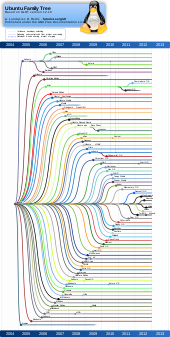 The LWN.net Linux Distribution List – Categorized list with information about each entry. Distrowatch – Announcements, information, links and popularity ranking for many Linux distributions. 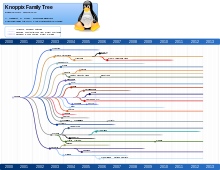 Linux Distros – Information and ISO files for many oldest Linux distributions.